If you enjoy using or creating handmade bath and body products, then you’ll love this giveaway. One lucky winner will receive six full size handmade products from Rebecca’s Soap Delicatessen, each of which come with their own DIY’s as part of Rebecca’s Soap Delicatessen’s Buy it. Try it. Love it. Make it. program. When viewing products simply scroll to the bottom of the page after the description for a link to that product’s corresponding DIY recipe. The prize for this giveaway includes one each of the following: Natural Patchouli Granola Crunch Soap, Red Velvet Cake Perfume Oil, White Tea Face Cream (made with a kit donated by Wholesale Supplies Plus), Natural Handmade Lanolin Shaving Soap (made with some donated ingredients from Nature’s Garden), Guavaberry Goji Scented Foaming Salt Scrub, and a Natural Lanolin Salve (also made with some donated ingredients from Nature’s Garden.) 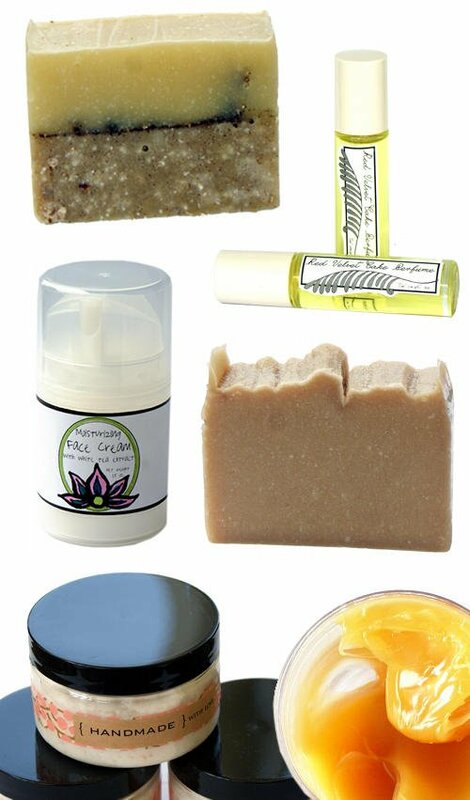 The recipes for the Patchouli Granola Crunch Soap, Red Velvet Cake Perfume Oil, and White Tea Face Cream also come with free printable labels for your own handmade bath and beauty product creations! The total original retail value of this prize is $54.45. USA residents 18 and up may enter to win through September 15th, 2013. See something you like? Now through the close of this giveaway, use coupon code: 5OFF25 to receive an additional $5 off your total purchase price (before shipping) when you spend $25 or more at Rebecca’s Soap Delicatessen. I hope I win. I’d love to try some of your products. I love the lay out of the website! Everything is super easy to find and all of the products look amazing! Would love to win! I hope I win! Everything looks delicious! The free printables are adorable! Greetings from Greece. It’s been a while that I read your blog and I just love your ideas and DIY. Hope I win. Love all the DIY wonderful recipe. Great printables. Love your recipes and would love to win something already made! I would love to win the products. Would like to try them. I love the purple tones and the flowers! How will the winner be notified? It doesn’t say in your blog post. The rules can be found via the Terms and Conditions link on the Rafflecopter entry forum. The winner will be drawn within 7 business days fo the close of the giveaway and will be notified via email. The winner will have seven business days to reply to notification that they have won. If the winner does not reply within that time frame or forfeits the prize, then the prize will be re-awarded and a new winner will be drawn or redistributed at Sponsor’s sole discretion. I love your website! Thank you for sharing your wonderful beauty recipes! I love how beautiful and natural all the products look! I love all the DIYs! You have such a great variety of DIY-posts and the instructions are easy to follow. The accompanying pictures of the process and finished product are great, too. Oh I want to win this giveaway. Would love to try that Patchouli Granola Crunch soap! I love the layout and the DIY recipes!